CG228: $10 Off Any Two Adult Tees (order of $31.94 or more). Looks like we’re DUBLIN’ up the savings with this week’s email deal. Get a custom St. Patrick’s Day tee (or any design) for you and your lucky leprechaun! Hurry up though for luck runs out 3/5/12, 11:59 PM EST. New Art for Custom St. Patrick’s Day T-Shirts! So, St. Patrick’s Day is right around the corner and you’re going to need a cool custom t-shirt that you can’t find on the shelves of your local department stores. Once you get your shirt customized, then you can design a tee for your lucky laddie, little leprechauns and even your St. Patty’s run or race! Oh, better yet, you can design your own drinkware too! Now, you might be planning a Pub Crawl with a lot of lucky laddies and lassies planning on getting a little fluthered (a little Irish slang for ya’) on the 17th. Our Group Discount can help you keep more greenbacks in your pocket for more green beer in your belly. Get custom t-shirts for the whole group! Ok, we’ve talked enough. Now, get over to the site and get your shenanigans on! Customized undies aren’t just for the ladies anymore! Have fun and customize a comfortable cotton classic for your guy …and design one for yourself! They make great bottoms for around the house. Featured with an elastic waistband and roomy fit, these customizable boxers will quickly become your favorite! Visit CustomizedGirl.com and create your own custom boxers today! Updated for 2016: Create Your Own Custom Dance Bags! Need a custom dance bag? You’ve come to the right place! Customized Girl offers a variety of sizes, shapes, and colors that any dancer will love! Our design center is packed full of fonts and unique artwork making every bag totally unique! Brianna received this delightful shoulder strap bag as a gift. It’s a great bag for her ballet gear, and it’s personalized with her name. These bags are decorated with a thin, precision-cut film that is then fused onto the bag with heat. It’s surprisingly easy to add your text, choose your font, choose you art, choose matching colors, and then check out. And remember: no minimums. You can buy 1 or 1,000. We’ll be happy to print it and ship it. 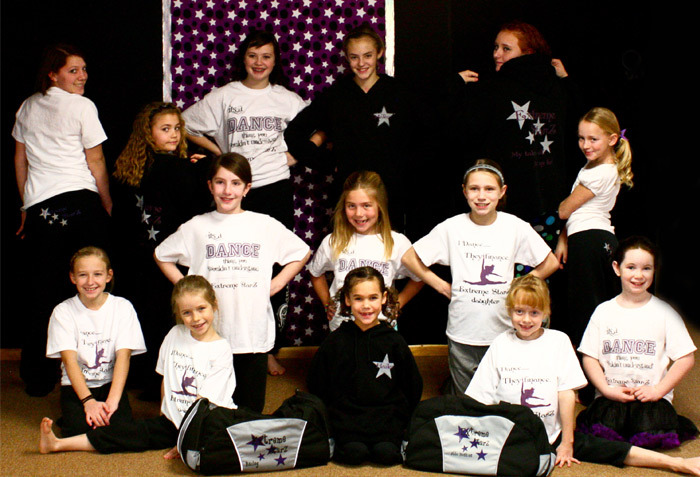 This dance team got their custom bags from Customized Girl… but they also got custom dance t-shirts and zip-up hoodies too! Their team colors are purple and silver and black, and we were very pleased to help them nail those color combos across each item. Update – July 2016: Our dance bag selection has grown and evolved! Unfortunately, it means that we had to drop our shoulders strap back that Brianna is showing off above. But we’ve been able to replace it with a different canvas sling bag. We’ve also been adding a lot to our duffel bag and sport bag selections. 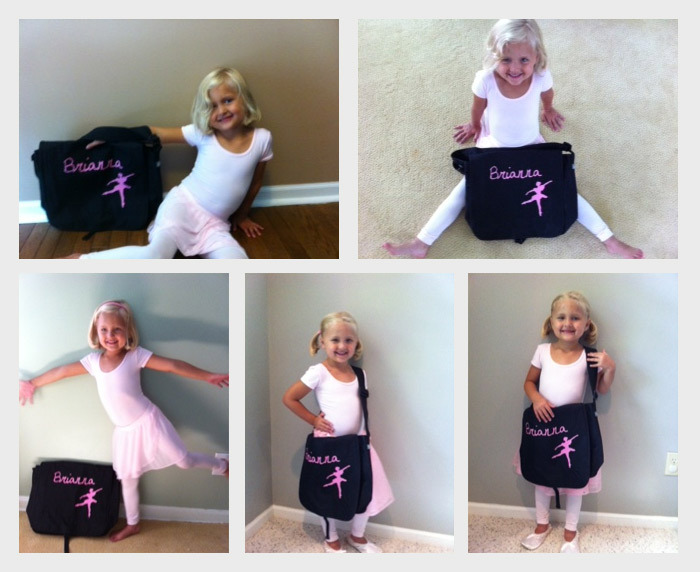 Check out our all of our customizable dance bag designs here. New Art for Custom Cheer T-Shirts! Our new art is something to cheer about! Check out our latest designs that are perfect for designing custom cheer t-shirts or custom cheer sweats. Don’t forget to pair your favorite piece of art with our most popular cool stunt bro hit it again shirt! 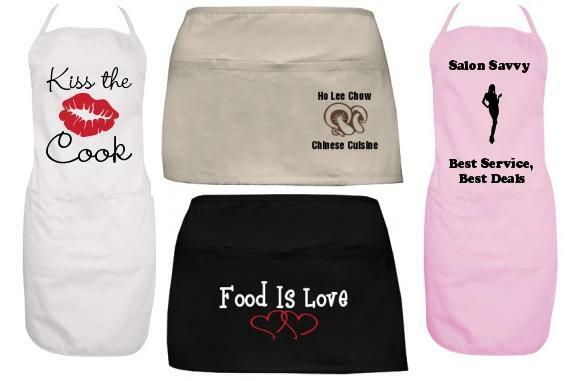 Cook Up Some Love With Our Custom Aprons! Our Custom aprons go way beyond the kitchen! They are perfect for hair salons, restaurants, even spas! We also have several styles to choose from, including: waist aprons with pockets, adjustable full length aprons, and promotional aprons! They are a mess free way to promote your business, so start customizing and create custom aprons today! Catch the luck of the Irish with code CG221! Shop all of our custom St. Paddy’s day apparel and receive 15% off your entire order! Hurry this deal ends 2/27/12, 11:59 EST. Custom St. Patrick’s Day Apparel! St. Patty’s Day is right around the corner and we’re here to meet all of your customizing needs! 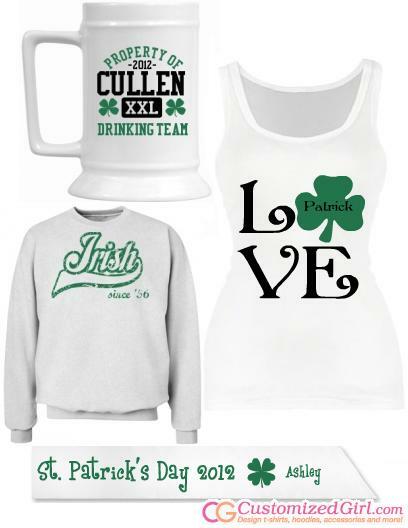 Browse Customized Girl’s gallery to create custom St. Patrick’s Day apparel that is perfect for anyone! We have drinkwear, custom t-shirts, and more! Get comfy with our custom sweatpants! Our sweatpants feature an elastic waistband, complete with drawstring. They are made with super soft cotton fleece making them a must have! Customize the front and back for a one of a kind piece that is perfect for sports teams, lazy afternoons, even gifts! 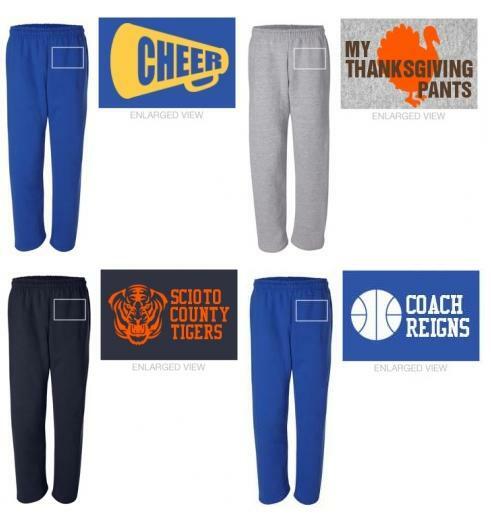 Design your own pair of custom sweatpants from CustomizedGirl.com today! And don’t stop there! Pair your sweatpants with one of our personalized hoodies to create a one of a kind custom sweatsuit!